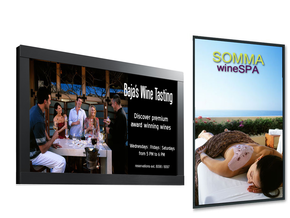 Guest Signage are digital and interactive ad-boxes. An excellent tool to promote outlets, brands and promotions in high traffic guest areas, restaurant entrances, or elevator landings. Your hotel will have its own and unique Digital Signage, with entertaining hotel and destination information, customized with your corporate branding. Boost your sales by promoting your restaurants, spa, meeting rooms and other services your hotel offers. Promote your own timeshare development and other Hotels in the chain. Your Hotel makes every effort to attract guests. Why give them information and advertising of your competition? Your signage will contain only your hotel’s information. With our advanced system, your hotel may easily make changes to their information, update promotions, restaurants hours and Spa details. Promote theme parties and special events. Your hotel may sell advertising in its program, generating a new source of income or making the service will not cost the hotel. Your hotel will be able to download the segments created by GuestEyes and use them for your promotion, publish on your website, social media, etc. Each hotel is assigned a Content Manager to manage the various means of media communication with your guests. A concept that is both simple and powerful. Guest Signage system is divided into 4 parts. See how it works. Contact us now to learn more about our Guest Signage service.